When we first moved into the cabbage, I started a compost heap. Nothing fancy. Just a pile of rotten wood and food scraps at the edge of our yard. I don’t turn it often. I never watered it. But every time the bucket of food scraps under the sink filled up, I’d carry it outside and empty it into the compost heap. Whenever the mood struck me, I’d shovel in some more rotting bark and pine needles to balance out the kitchen scraps. We never bothered setting up any counter-measures against scavengers, so we’ve gotten to watch the local wildlife foraging through our compost pile. The ravens love it. One morning, Drew even woke up to find a bald eagle picking through the heap. It also meant we’d sometimes find food scraps dragged across the yard. In short, the compost heap was as poorly planned and half-assed as most of the rest of our homesteading adventure has been. So you can imagine my surprise when I went to move it the other morning (we planted rosebushes in its place), only to discover that it had actually managed to yield something resembling usable compost. It feels like a metaphor for this whole move. Since we left Seattle, almost nothing has turned out the way we planned. Our grandiose dreams of escaping the rat race and living off the land got a reality check pretty quickly, confronted with bills, debt, and the very real cost of building supplies. We both found jobs. Progress on the cabbage stalled. Yet we moved out here to live a life more in-line with our values. For the most part, we are. We both work a lot, but it’s good work and we enjoy it. Clean-up of the site has been slowly happening, and we have a small vegetable garden. We recently added a puppy to the growing homestead. (More on him in a later post!) We’ve started seriously researching geese and goats. The compost heap reminds me that transformation can happen through a series of small, and sometimes accidental, steps. Take two humans and a Siamese cat. Toss into the country. Add sunshine. Rain. Occasional bursts of hard work. At a deep level, the food scraps in my bucket want to break down into compost, and given the right opportunity, they did. Sure, it could have been prettier and more efficient. But it still counts. 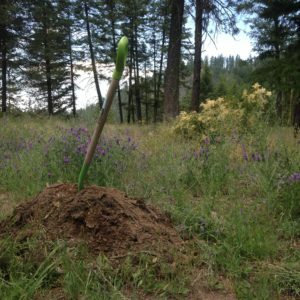 It’s slow compost, I suppose, just as we are slow homesteaders and this blog is definitely a slow blog. But that’s okay. We didn’t come out here to monetize this blog. We don’t want to be internet famous. We’re not even all that interested in building up a readership. Mostly, we want to document our progress. The compost heap reminds me that even slow progress is worth documenting. Love this! It makes me happy to see you in this joyful adventure. Reality of work, beauty of nature, dog and all. Thanks for sharing. Denise from UUCY. I very much enjoy reading the blog each time you post it. Living in the hectic, don’t care about anything, keep it up, keep it going, or die Western side of the state, I am trying to show patience and support to my dear hubby (your Father in law) to retire and move away! He will be taking some vacation in four weeks time and we will be visiting you and Andy. You have no idea how much I am looking forward to it! I MISS you two so much! Yes, I can call and text and I agree it is better than nothing but damn it, I ENJOY you two! I am looking forward to seeing your garden growing, and thriving. When Gary and I were there last, it had just been planted and we all had high hopes that it would thrive and produce for you. Above all, I am so looking forward to seeing your new member of the family , Gansey! Gary and I are going to be hopeless pseudo-grandparents, we have already bought him toys and Nicky too of course! I am sure that we will have a wonderful time. What you two have done with your lives is amazing, and Gary and I are so proud of both of you!